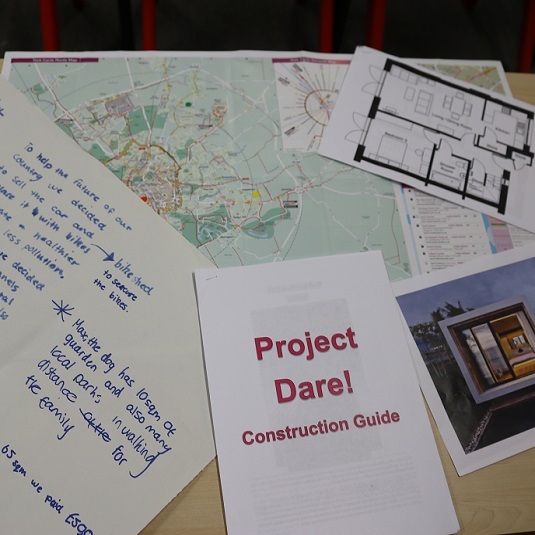 Over the last couple of years, we have worked with the Joseph Rowntree Foundation and Joseph Rowntree Housing Trust on an activity called Project Dare. The activity has been really successful generating great feedback from employee volunteers and pupils alike. This year, York Cares are expanding on Project Dare through funding from the National Collaborative Outreach Programme. Part of our Aspirations programme, Project Dare aims to inspire disadvantaged young people about possible futures, broadening horizons about graduate jobs and higher education pathways. We aim to empower young people to succeed through personal encounters with people at university and in work and thereby motivate them to aim higher and work harder at school. Project Dare is delivered by an employer and supported by University of York student volunteers. The project is made up of three half day sessions, two of which take place in school and a third session which is a visit to the employer. Pupils take part in a range of activities from team building to a ‘Careers Speed Shop’ to increase their confidence and give them an insight into the huge variety of roles that are available within an organisation. The main focus of the project is a real life problem solving activity which links to the sector that the employer delivering the project is from. Pupils are given a tangible brief and they work in groups to solve the problem before presenting their solution back to the rest of the group. Project Dare will be delivered three times over this academic year, and each one will be delivered by a different employer. Over the course of the year we will be working with employers including Benenden and Aviva who will each be giving pupils an insight into their business through a real-world activity. Coming up first will be a Project Dare themed around marketing with a link to mental health which will be delivered by employee volunteers from Benenden. During this project, pupils will learn about the ins and outs of marketing before being given their real world problem solving activity to complete in groups. Emmie Wise, CSR and Engagement Co-ordinator from Benenenden shares her thoughts on the upcoming Aspirations activity, “We are so proud to get stuck in and deliver our very own Aspirations Programme for young people in and around York. We feel this particular programme is quite special, as staff from across the organisation will be pitching in to deliver presentations and talk the student through various educational exercises. Our theme this year is mental health, and we’ll be asking pupils to deliver a marketing campaign in order to raise awareness on the subject. We’re hoping this will provide them with the tools they may need when dealing with issues such as anxiety and depression. At the same time, this programme aims to build their confidence and career skills, so we’ll be inviting pupils in to our regional office to see the inner-workings of the organization. We’ll be holding workshops on CV’s and interview skills, and staff will be recalling the career paths they’ve trodden to get where they are now – and some journeys have been quite out of the ordinary! The Aspirations programme seeks to bring the world of work to life by challenging young people with real-world problem-solving and empowering them to succeed. Volunteering as part of this programme is a great way to share your skills and sector with a group of young people inspiring them to aim higher and work harder. If you are interested in finding out more about our Aspirations programme and Project Dare, please get in touch.